Chocolate Covered Golden Oreos - Frugal Mom Eh! 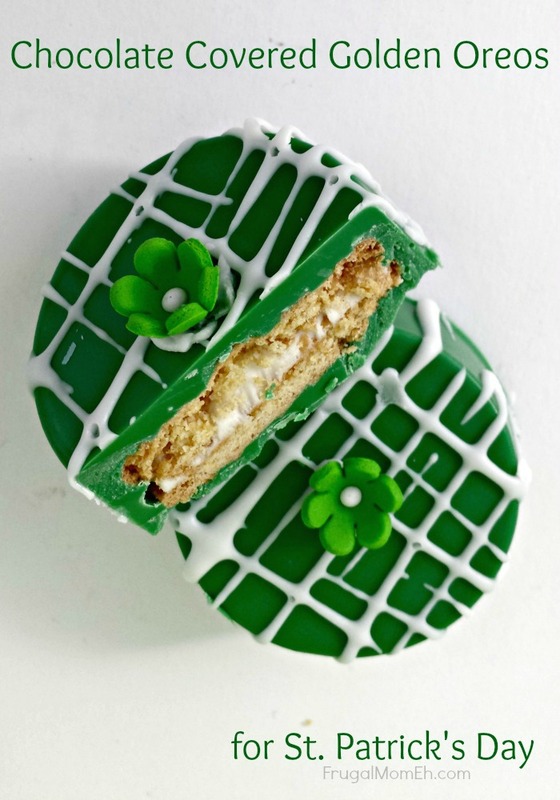 Sometimes it’s super nice to have festive treats on hand, such as these Chocolate Covered Golden Oreos for St. Patrick’s Day, that look impressive to guests but are really just fuss free and easy to throw together. 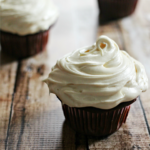 The best part about this recipe is that it can be easily adapted to suit any holiday – plus they are super yummy! Melt half the pink chocolate as per instructions on the bag. Spoon about a tablespoon of the melted chocolate into the bottom of each well, then gently press an Oreo into each. Spoon more chocolate over the Oreos, making sure to get the sides between the cookie and the edge of the well. Remove from the mold and place the cookie onto parchment paper. Repeat with the steps with the remaining ingredients. Drizzle the cookie icing in a criss cross pattern across the top of the cookies. Attach the flowers to the top of the cookie using a dab of melted chocolate. Let the cookies set in the refrigerator for an additional 25 minutes. Great idea, thanks for sharing it!!! 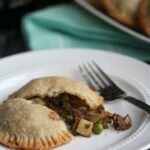 I thought this would be challenging but the recipe is so easy! What an awesome idea! I absolutely love this and seems pretty easy! Would be fun to make for K to take to school! 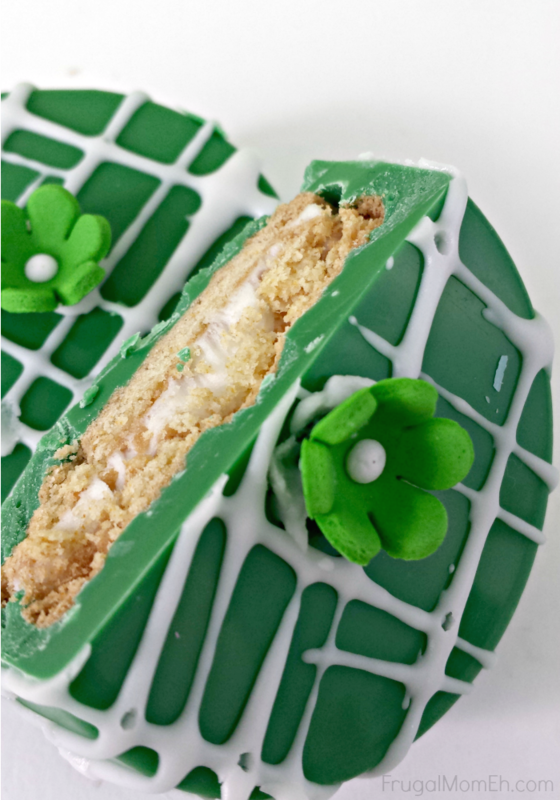 these are so cute for st. patty’s day! I have not seen these cookies before and hopefully they have them in my supermarket! 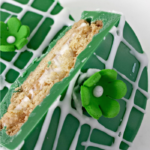 how awesome love this idea for st pattys day treats! I love this idea! They would be great for my kids and I to make together. 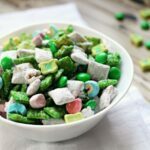 This looks amazing, and I love finding recipes for the upcoming holidays. Woohoo St. Pattys day. I’ll be pinning this to my Pinterest Board . Yours look picture perfect!! I hope mine come out so beautifully! Chocolate covered Oreo’s, I am in all the way! These are really cute for St. Patrick’s Day. These cookies look cool, but I can taste the major sweetness just by looking at them in the pic lol. What a great idea,thanks ! 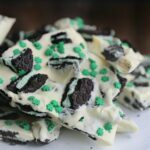 This Chocolate-covered-golden -oreos is a perfect dessert for a St. Paddy’s Day supper or an Irish Party. Thank you for this recipe. All I have to do is find the little ornaments before next March 17. So pretty, but so simple! They look wonderful. This looks like something I could do….and so pretty. I love Golden Oreos so as long as there is no mint flavour in them, I’m all in.